In 1889, Henry Ogle Bell-Irving acquired options on nine operating fish canneries: seven on the Fraser River and two on the Skeena River. On 14 april 1891, Bell-Irving purchased a Prospectus for $330,000. Later that year on the 22 December, the Anglo-British Columbia Packing company was incorporated in Middlesex, England. Bell-Irving's firm, then named Bell-Irving and Patterson, was appointed first Managing and Selling Agents. They maintained a head-office for the company in Vancouver, and titular head-office in London, England. In 1894, the Anglo-British Columbia Packing Company began expansion of their operations by constructing the Good Hope Cannery on Rivers Inelt. In 1895, H.O. Bell-Irving and Company assumed sole Managing and Selling Agent responsibilities. Also in that year, the Anglo-British Columbia Packing Company established the Fidalgo Island Packing Company, which remained a subsidiary until 1964, when it was sold. In 1931, after the death of H.O. Bell-Irving, the management of the Anglo-British Columbia Packing Company was assumed by Bell-Irving's son Richard and Peter Traill, both former directors. In 1966, the company expanded its operations to Caraquet, New Brunswick, where it built a herring reduction plant. The Anglo-British Columbia Packing Company sold the salmon cannery business in1969,yet continued to operate the herring reduction plant until 1974, when the company folded completely. Newell, Dianne, ed. The Development of the Pacific Salmon-Canning Industry: A Grown Man's Game. Montreal: McGill-Queen's University Press, 1989. The records date from 1891 to 1968 and were acquired by the University of British Columbia's Special Collections between 1970 and 1972. The fonds consists of general ledgers, payroll ledgers, invoices, vouchers, fish registers and financial statements generated by A.B.C. 's affiliated canneries (1914-1968). These records originated primarily with the following canneries -- Alert Bay Plant (1947-1968), Boswell Cannery (1924-1934), Caledonia Cannery (1928-1959), Good Hope Cannery (1895-1968), Knight Inlet Cannery (1924-1961), McTavish Canner (1923-1939), North Pacific Cannery (1937-1958), Phoenix Cannery (1915-1967), and Seymour Cannery (1911-1913), as well as Britannia Shipyards (1934-1967). 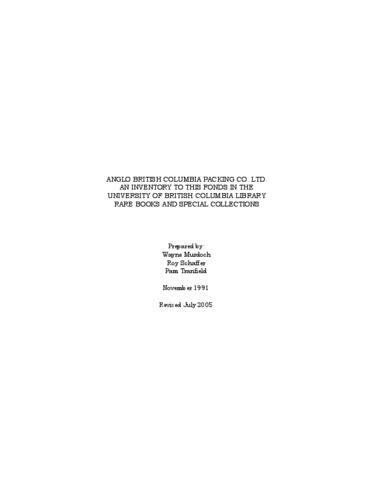 The records of the Anglo-British Columbia Packing Company were acquired by the University of British Columbia's Special Collections between 1969 and 1972. There is no accession documentation for this fonds, and the name of the donor and reasons for transfer to this institution unknown. This fond is related to other fonds generated by H.O. Bell-Irving and Company, such as the H.O. Bell-Irving Insurance Company.